It happens to the best of us. One minute you're knitting along happily, and then you look down at your work and see a stitch that isn't right or maybe even a whole row out of place in your pattern. Don't panic -- problems like this really do happen to everyone and they're usually pretty easy to fix with a little patience. So sit down, take a deep breath, and determine the best way to deal with your particular problem. The first step to fixing a knitting misstep is to identify the extent and location of the problem. The solution will be different depending on whether you need to fix one or two incorrect stitches in the row you just worked or a whole row of misplaced pattern several or many rows back. Let's take the easier problem first. If you notice a mistake in a row as you are knitting it or when you have just finished it, congratulate yourself for your eagle eyes. This is the easiest problem to fix. All you need to do to fix this issue is to retrace your steps along the row, "unknitting" the stitches and getting them back on the left-hand needle so you can knit them correctly. Seasoned knitters call this process "tinking" (tink is knit spelled backward). Stick the left-hand needle into the loop of the stitch from the previous row and pull gently on the yarn attached to the ball so that the loop from the row you were just working goes away. With practice (and if you're like most knitters, you'll get a lot of practice) this is really easy. Just make sure when you tink that your working yarn is in the front when you're taking out purl stitches and in the back when you're taking out a knit stitch, or the yarn will get caught between the loops on your needle. Once you've worked back as far as you need to, start knitting again like normal. But what if your mistake is more dramatic or happened a long time ago? Now your fix isn't as easy, but it's still possible to turn your project around. If your mistake is larger or happened several rows back, the quickest way to remedy the situation is to take the work off the needles entirely and unravel it to a point before the mistake occurred. Note where your mistake is and where you'll want to stop ripping. Remove the project from the needle and set it flat on a table with good light so you can see what you're doing. Gently pull on the yarn and slowly allow the work to unravel. If you pull too hard or quickly, the fibers can get a little agitated, making it difficult to identify all the individual loops you need to put back on the needle. Once you've ripped to a point past your mistake (I usually rip out one row beyond the messed up row for good measure), carefully thread the loops back on the needle in the right order, making sure you end up with the same number of stitches you started with. Remember, your working yarn should be at the top of the needle when you start knitting again, so thread the stitches starting with the opposite end, regardless of which side was up when you started ripping. Make sure you know where you are supposed to be in your pattern and start again from there. Fixing mistakes can be a little nerve-wracking, but if you can notice them and fix them before you finish your project you will be a lot happier with the results. What Does it Mean to Frog Your Knitting and How Do You Do It? Do You Know the Difference Between Knit and Purl? What Causes Holes In Your Knitting? 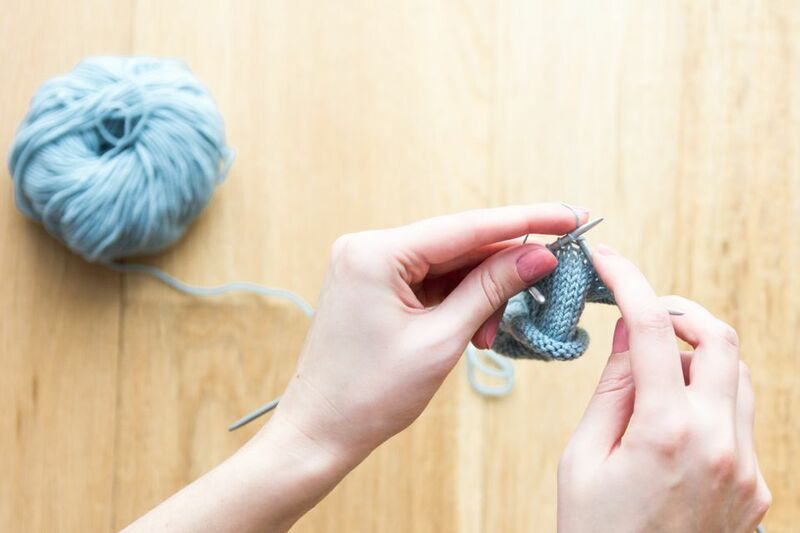 Learn What to Do If You Drop a Stitch While Knitting?